Charity - In aid of Brain Tumour Research. In Loving Memory of Lola Rice. I am very proud to announce that our recent Brighton Charity Ball held by Gifts for Angels and Vivacious Events on behalf of the charity Brain Tumour Research, has raised in excess of £8000.00. Brain Tumour Research is a cause very close to my heart as this was the devastating disease that took away My Darling Lola. I firmly believe that research is the only way. 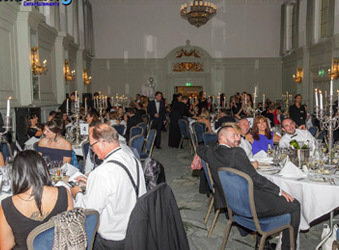 On Saturday 8th October 2016, over 170 guests, the men all dressed in their stylish Tuxedo’s and the ladies adorned in their finest outfits, attended the Brighton Charity Ball held in the wonderful and ornate Clarence Room at The Brighton Hilton Metropole, all of them enjoying an amazing evening of top quality entertainment, food and dance. 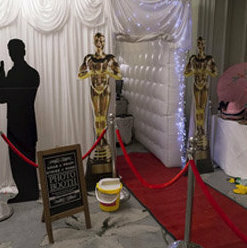 Amongst many highlights of the ‘Hollywood Glamour ‘ themed evening were gold human statues and live dancing all provided by the outstanding Manic Stage Productions team who thrilled the audience with their stylish show reel production. Prior to the sumptuous three course dinner, served outstandingly by the Metropole wait team, guest Speaker Tim Green from Brain Tumour Research made a heartfelt and articulate speech thanking everyone for their support and informing guests of both the outstanding work carried out by the Brain Tumour Research team and the necessity of funding from events such as Brighton Charity Ball. The Brighton Charity Ball was also filmed by LGood TV on the evening. Later in the evening guests were treated to music provided by live band The Soultastics who played some great tracks and who soon had guests dancing away to their classy and soulful tracks. Making a significant contribution to the amount of money raised by this event were funds raised by both the sale of raffle tickets and auction items, and we would like to pass on a most sincere thank you to our generous donators and our guests, and especially to our main event sponsor David Wilson Homes without whom this event would not have been possible. Following the calling of the raffle and live auction expertly handled by our talented Master of Ceremonies Mark Lanahan, the evening finished with a disco, music played by Bluedawg Entertainment who also provided photography and a photo-booth for the evening, the latter also providing an opportunity for guests to give a donation to Brain Tumour Research. 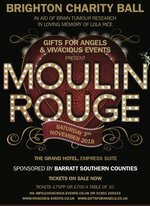 Vivacious Events and Gifts for Angels would like to take this opportunity to extend a huge thank you to everybody who played their part and helped to make the evening such an outstanding success, all of which has helped to raise such a fantastic amount of money for Brain Tumour Research.